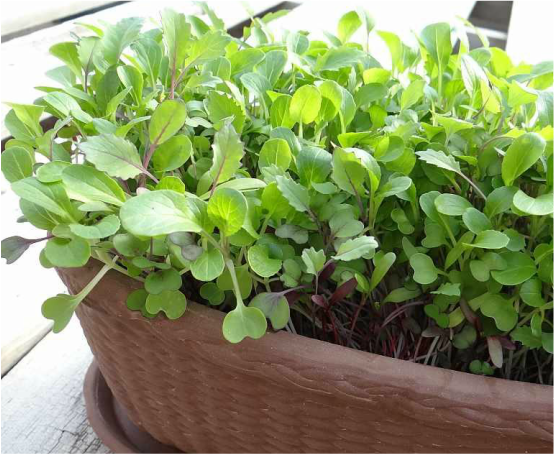 Microgreens add both flavor and nutrients to fresh garden salads and sandwiches.. Although you can certainly mix your own assortment of greens - such as spinach, chard, lettuce, beets and peas - buying the seeds for microgreens in a kit makes sense for those who don't normally grow a wide assortment of vegetables. Available from seed catalogs and other online vendors, these baby greens are harvested shortly after the sprout stage. Planting: Plant microgreens in flats filled with seed starter or plant them directly in the soil as soon as it can be worked in the spring. Space seeds no more than two inches apart in all directions. Broadcasting the seed over a wide row - or over the surface of the seed starting flat - and covering with ½ inch of soil works best. Water to moisten the soil and keep the soil moist until seedlings emerge. Some seedlings may appear within three to five days, while others may take up to two weeks, depending on the specific mixture of seeds. Germinating: Cover the top of the container with clear plastic wrap to conserve moist and place in bright indirect light. Indirect light refers to light from a window that does not shine directly on the plant trays. Because most greens prefer cool soil and cool growing conditions, heat mats are not recommended for starting microgreens. Light: Once the seeds germinate, remove the plastic cover and gradually introduce the seedlings to full sun. Watering: Water when the soil dries to the touch or when you observe signs of wilting. The amount of water required depends on the particular greens grown and their rate of growth. Some may require daily watering. Harvesting: Harvest microgreens as soon as the seedlings have developed two to four leaves, typically when they are less than four inches tall. Clip the greens at the soil level with clean scissors or a sharp knife. Many will continue to grow, sending up new foliage to replace those harvested. Serving: Serve microgreens in fresh garden salads or add to sandwiches for a tasty alternate to traditional iceberg lettuce. Microgreens make an excellent choice for windowsill gardens. With adequate light they can be grown all year long, providing your family with a host of vitamins and minerals that promote good health.